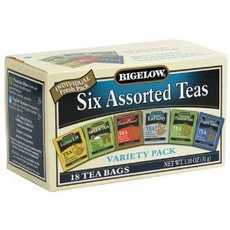 Enjoy Bigelow 6 Assorted Teas. Individual Fresh Pack. Variety Pack. Take Your Favorite Tea Wherever You Go! Bigelow's Individual Flavor-Protecting Envelopes Ensure Great Taste And Freshness. Indulge In The Soothing Ritual Of Tea. Sipped Throughout The Day, Tea Quenches, Soothes, Satisfies, And Delivers Healthful Antioxidants. From The Wonderful Aroma That Fills The Air The Moment It Starts Steeping, You'Ll Know That Bigelow Tea Is Like No Other. To Create Each Of Our Distinctive Teas, We Blend Tender, Hand-Picked Tea Leaves From High-Elevation Gardens Where The Best Teas Are Grown, Then Individually Wrap Our Tea Bags In Flavor-Protecting Pouches To Seal In Its Goodness. Remember, Adding A Cup Of Bigelow Tea Throughout Your Busy Day Can Contribute To Your Overall Well Being. So Sit Back, Relax And Make Tea Time Your Time To Refresh Mind, Body And Spirit! Assortment Includes 3 Tea Bags Each Of: 1. Lemon Lift - Tea With The Refreshing Flavor Of Lemon And Spice; 2. Green Tea - Delicate And Flavorful; 3. Constant Comment - Tea Flavored With Rind Of Oranges And Sweet Spice; 4. Earl Grey - Perfectly Flavored With Natural Bergamot; 5. Plantation Mint - Fresh And Flavorful Tea With Natural Spearmint Leaves; 6. English Teatime - Invigorating Black Tea In The English Tradition. Blended And Packaged In The Usa. (Note: Description is informational only. Please refer to ingredients label on product prior to use and address any health questions to your Health Professional prior to use.